Way back in the ancient year of 2003, newsstands overflowed with tech magazines proclaiming that it would be the Year of the Tablet. Microsoft made a big deal of the touch capabilities of Windows and computer makers pumped out a slew of laptops with displays that swiveled around, converting into tablets. Thing is, that touch revolution didn’t revolutionize much of anything. Windows continued to be kind of crappy for touchscreens, the “tablets” manufacturers made rarely appealed to normal people, and Microsoft didn’t make many bold leaps forward. Fast forward to 2010 and the debut of the iPad. In the months leading up to its debut, a flurry of activity in the tablet market (fueled by rumors) produced a few slates of interest. The iPad still wowed us all. It took a couple of years, but Microsoft finally answered Apple’s challenge with the Surface tablets. Running a touch-friendly operating system that works as well on a normal computer or a tablet (or so the company says), the Surface Pro is the kind of tablet the market was waiting for, in theory. But on close inspection and comparison, which of these tablets is best suited to your needs? The first thing you look at on a tablet is the screen. There are a lot of numbers we can throw at you to highlight difference between the iPad and the Surface Pro, but numbers don’t tell the whole story. Putting them side by side, you probably won’t be able to tell which one is more pixel dense or has the higher resolution. What you might notice more is that the Surface Pro has a wider screen than the iPad. This means bar-less widescreen HD video watching. With the iPad’s aspect ratio you can fit more text on the screen in landscape mode than you can on the Surface, meaning less scrolling, but your videos will shrink a little, or have their sides chopped off like an old-school television. The Surface’s display is really bright, which makes the screen pop. However, it’s not as vibrant as the iPad and the colors aren’t as rich. Text is crisp on both. 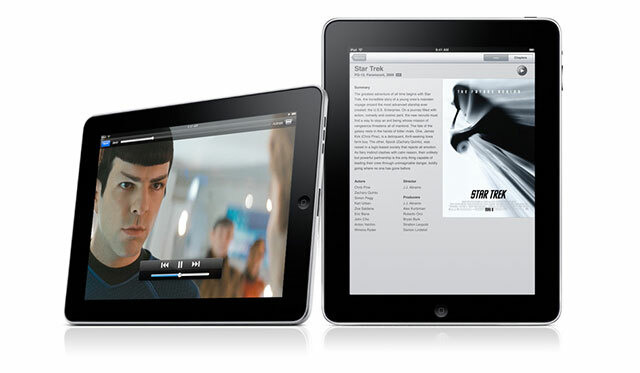 Though they both have great HD screens, the iPad’s display is higher quality. Touch performance on both is about the same. The Surface Pro does pack an extra feature though: stylus compatibility. The tablet comes with an active digitizer pen with WACOM technology. This offers more accuracy than a capacitive stylus that can be used on any touchscreen. It also helps with palm rejection – the Surface Pro will ignore the hand resting on the screen if you use the stylus to draw, mark up documents, and take notes. 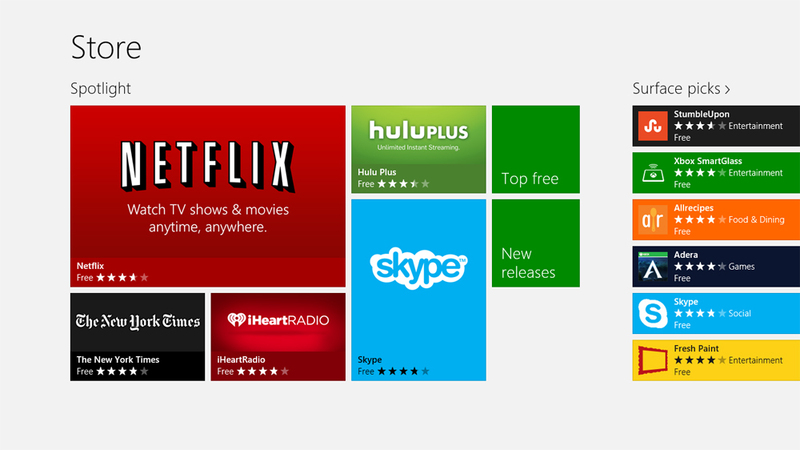 Given Windows 8’s desktop legacy apps, it’s also useful for navigating non-touch friendly menus and icons. Sadly, you’ll probably lose the pen because there’s no slot to store it on the tablet. Both the iPad and Surface Pro are good-looking tablets for different reasons. More important is how they each feel in the hand. The Surface Pro’s design is attractive and the build quality high, but the ergonomics are problematic. To start, the edges have a tendency to dig into hands the longer you use it thanks to the relatively hefty 2-pound weight. The default orientation is landscape, so the button placement is designed with that in mind. Once you turn the tablet to different orientations, the buttons start to get in the way. Plus, using the Surface in portrait is more awkward than doing so on the iPad, partly because of the 16:9 aspect ratio. The tablet is longer and the balance can feel off when holding it on the bottom edge. The iPad’s default orientation is portrait and, though wide in comparison, balances well in the hand, even when typing. The aluminum back isn’t warm or soft, but the tablet is comfortable to hold. The back tapers just enough, the edges aren’t too sharp or biting, and the 1.4-pound weight is light enough to not tire an arm out too quickly. Chances are if you’re trying to decide between the Surface Pro and the iPad you’re doing so because you want a tablet that can do more than just play games and videos. A robust ecosystem of apps sprung up around the iPad even before Apple revealed it to the world. Owners have their choice of dozens of office suites, text editors, photo editors, video editors, and many more in the App Store. And the hardware inside the iPad can handle a lot. Though apps are getting better with every month, the iPad’s limitations make getting work done difficult. The lack of universal file explorer, the inability of all apps to talk to each other and share files, and a complete lack of multitasking can make getting simple things done a frustrating experience. The iPad’s sole, proprietary port is also a hindrance. In order to connect a camera, memory card, USB flash drive or cord, you need an adapter. Apple’s baby can be a good productivity partner with some help. A mountain of wireless keyboards and mice exist in the iPad hardware ecosystem, plus third-party styluses and docks that extend the tablet’s usefulness. And if your productivity needs are simple, the available tools make it possible to edit and create without having to touch a real computer. Microsoft’s Surface Pro is a real computer. It takes the form of a tablet yet doesn’t suffer from the same restrictions of the form factor. Since it runs full Windows 8, you can run any program that works with Windows 7 or Vista. You won’t run into compatibility issues with files, messed up formatting, and limited tools. Windows 8’s touch friendly interface replicates some of the iPad’s issues. Stick to Desktop mode and you get the same interface (almost) as Windows 7, including the easy multitasking and window switching. The full-size USB 3.0 port means you don’t have to buy an extra adapter to connect peripherals. You may want to invest in a USB dock or splitter, though. The included stylus is a big boost to productivity, as are the two keyboard covers made specifically to go with it. 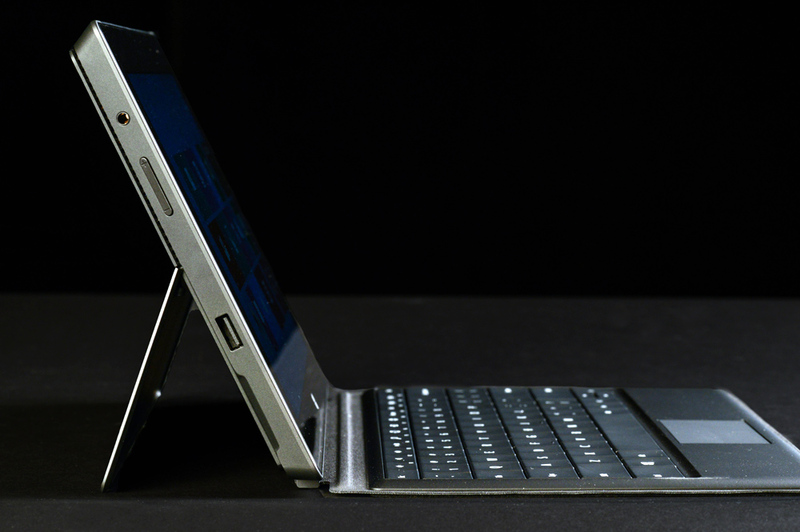 You have your choice of a smart cover/keyboard without mechanical keys or one with them and a touchpad. The touchpad is less than ideal and you’re better off just using the touchscreen. The keyboard offers a decent typing experience without adding too much bulk to the proceedings. In the mobile tablet world, the iPad usually has the advantage over other tablets due to the sheer number of apps made specifically for the platform and the robust media options available. However, just as with the last category, the Surface Pro has the advantage of being a real computer in tablet shape. That means owners aren’t limited to what’s available in one App Store and content restrictions are far less of a problem. There are 250,000+ apps for the iPad, and hundreds of thousands of programs that will work with the Surface Pro. The difference between them is that the iPad’s apps are all custom-designed to specifically run on it. Almost anything you want to do on a tablet you can do on a PC, and most apps just replicate existing Windows programs/functions already available. However, using desktop apps can be a hassle. They aren’t always touch friendly. The Surface’s Pro’s big weakness is that programs running in Desktop mode aren’t made for the touch-first experience, and it can be frustrating to navigate them with just a finger. Sure, you can break out the stylus or a mouse. That’s an extra thing to carry around and worry about (especially since there’s no internal port for he stylus). Programs don’t always scale correctly on the Surface Pro, and the experience isn’t always ideal. Still, the ability to load almost any Windows program is a powerful one. Games are an issue unto themselves. The Surface has Ultrabook internals, and Intel’s integrated graphics are fine for casual games. Anything more complex requires escalating sacrifices in quality. Many games for the iPad are casual, but some more complex titles utilize the tablet’s graphics power to deliver an exceptional experience. Again, iPad’s games will always run. With Surface, it’s more of a crapshoot. The Surface Pro returns to flat out dominance here. The iPad is a great media machine thanks to the vast iTunes catalog and the number of apps for playing music and video and reading books and magazines. Pretty much every source for media the iPad can access is available for the Surface Pro, too. You can even run iTunes on it if you want. Windows PCs can access Hulu without a special app (or needing to pay for Hulu Plus), Amazon’s video catalog, even Google Play media. Thanks to Flash, Web media is accessible with little to no fuss. You can even read books from your Nook or Kindle account. Want to load your own video or music? You probably don’t have to worry about codecs or incompatibility. Double click and it plays. At the same time, iPad has apps that will replicate most functionality, sometimes more effectively than the Web, and certainly more cleanly. This one is tougher to compare since the iPad and the Surface Pro run on different types of processors. Both are capable of smooth and speedy performance. The iPad is top among ARM-based machines. The Surface Pro runs like an Ultrabook since it utilizes the same processor. One thing worth noting: that Intel Core i5 processor and the other components get awfully hot when you push the Surface with intense tasks like 3D gaming. The iPad doesn’t have the same heat issues (thanks to the cool, efficient chip inside). The efficient ARM-based chip inside the iPad helps it to last for over 10 of normal use, including watching a lot of video. This is the tablet you want with you on the trans-Atlantic flight. The Surface Pro will last about 7 hours, max. This might be due, in part, to the Intel chip inside, but the biggest culprit is a relatively small battery. The iPad comes in four different storage capacities: 16, 32, 64, and 128GB. The Surface Pro comes in two: 64 and 128GB. If you’re going for the Surface Pro, you should opt for the 128GB version. The 64GB version’s SSD is almost completely filled before you take it out of the box, leaving around 13GB for your programs, media, and documents. Not a lot, even if the Surface is a secondary device. You won’t get to fill up every last megabyte on the iPad, either, though iOS and pre-loaded apps take up less of the overall percentage of the memory, even down at 16GB. The iPad starts at $500 for the 16GB version and goes up to $700 and $800 for the 64GB and 128GB models, respectively. The Surface Pro costs $900 for the 64GB and $1000 for the 128GB. This price includes the stylus but not the keyboard cover. Is the Surface Pro worth the $200 premium over the iPad? That really depends on your needs. The Surface is a tablet computer, a full-fledged PC in slate form. On the productivity front, it rules. And if media is your thing, there’s way less hassle involved in dealing with a Windows machine. However, there’s no getting over the heat issues, the ergonomic missteps, the poor battery life, and the need to buy a thousand dollar machine in order to have enough space for your stuff. The iPad may not have access to every program or every media content source, but it’s hooked up with enough. The more comfortable design and better display coupled with long battery life a great performance make it a great tablet choice. Yes, it’s not as good on productivity as the Surface, and it shouldn’t be your first choice for a work-only slate. As a companion to a laptop or desktop, it gives owners some flexibility in both work and play.